The 5 Best-Selling Eyeshadow Palettes At Sephora | Top Beauty Blog in the Philippines covering Makeup Reviews, Swatches, Skincare and More! Hello loves! I don't know about you but every time I see an eyeshadow palette I get excited. The feeling of playing with them and combining different shades to create a variety of look is just so fun! Having said that ― in this post I have decided to compile five of Sephora's highly rated and best selling eyeshadow palettes. They're also from some of the best and most popular brands out there, so you can be sure you trust what you're getting. Did your favorite made it on the list? Too Faced The Chocolate Bar Eye Palette - This beautiful assortment of chocolate-inspired shades were formulated using real cocoa powder. Encased in a playful chocolate bar tin, the rich selection of the perfect browns, neutrals, and little pops of color appeal to every candy lover. Urban Decay Naked 2 - The follow up to the original bestselling Naked palette, this stunning second edition proves that neutral is anything but boring. Showcasing a dozen completely different shades than the first bronze-based collection, it includes a stunning range from pale and deep, to matte and sparkly. You'll achieve a host of new neutral looks, smoky dramatic eyes, and everything in between. Kat Von D Shade + Light Eye Contour Palette - Transform your eyes through the art of contouring. After tapping into makeup pro secrets, Kat Von D created this first-of-its-kind eye shadow palette. It’s specially-designed for eye contouring, a groundbreaking technique once used only by beauty experts to define and enhance eyes. Each velvety powder is blendable and buildable, and it features Kat Von D’s signature high-pigment, long-wear eye shadow formula, created to deliver rich color that lasts all day and all night. Urban Decay Naked Smoky - Sweep on popular smoky eye looks with Urban Decay’s Naked Smoky. Packed with all the essentials needed to create the perfect neutral smoky eye, it offers an array of shades, a double-ended brush, and a detailed lookbook that breaks down four amazing ways to nail any smoky look. Tarte Tartelette Amazonian Clay Matte Eyeshadow Palette - By popular demand, tarte is introducing an all-matte shadow palette featuring 12 never-before-seen shades to inspire, celebrate, and empower real women. 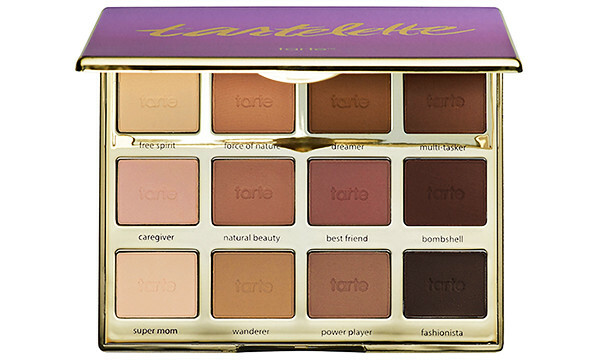 As beautifully diverse as the brand’s loyal fans, this sleek, statement palette features tarte’s signature Amazonian clay-infused, long-wear eye shadows in a mix of liner, lid, and crease shadow shades. The Naked palettes are the best! I need the KVD in my life! The Naked Smoky palette looks amazing! I love palettes too!! *-* naked 1,2,3 are my favourites! I love Naked palettes very much! All this palettes are amazing! I love Shade Light palette, it's amazing!